provide training and resources in nonviolence, direct action, and social change. To thank you for your support, we have some gifts to distribute! T-shirts: set up a regular donation of £20/€22/$25 and we will send you a free “War is a Crime Against Humanity” t-shirt - email info@wri-irg.org to let us know your size. Books: a regular donation of £10/€12/$14 means we will send you a copy of our Handbook for Nonviolent Campaigns. Badges: A regular donation of £5/€5/$5 gets you one of our beautiful broken rifle pin badges. For any questions related to donating to WRI, please email info@wri-irg.org, or call +442072 784040. Clicking the button below will transfer you to the Paypal website, and give you the option to send a one-off donation, or setup a regular monthly donation. This can be done from anywhere in the world, and you do not need to create a Paypal account. Supporters in the UK can donate easily by setting up a regular monthly direct debit via the GoCardless platform. Click the buttons below to choose a regular monthly amount, which will take you to their secure website. WRI's direct debits are handled securely by GoCardless Ltd., a UK-based payment handling service. Donations may appear on your bank statement under their name. For more information about GoCardless and direct debits, please click here. To cancel a recurring Direct Debit donation at any time, simply contact us. The quickest and easiest way to give to us regularly is via Paypal or Direct Debit. If you would prefer to support our work with a regular standing order, please download this form, print it off, fill it in, and return it to us at: War Resisters' International, 5 Caledonian Road, London, N1 9DX. If you would prefer to give to WRI via our fiscal sponsor in the USA, you can send a one-off or monthly tax deductible donation to WRI via the website of AJ Muste Memorial Institute. 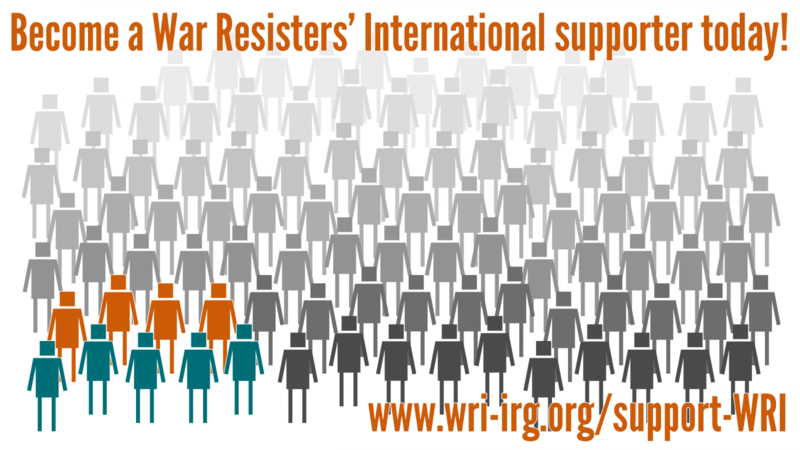 If you live in Germany and would prefer to donate to WRI via our fiscal sponsor there, you can do this through Förderverein War Resisters International e.V. here.